12 Days of Kid-mas Activities: Holiday Fun! I thought an Advent Calendar with kids activities would be a fun holiday tradition, but then I realized 24 activities might be hard to fit in with everything else going on during the season (shopping, sending cards, decorating etc!). So, instead I came up with 12 Days of Kid-mas! 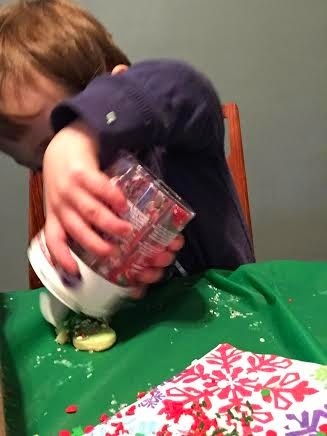 12 kids activities to do with your toddler or preschooler this holiday season. You can start right away or wait until the 13th to use as a countdown! Day 1: Snowflake Bottle Stamp Painting: grab some empty plastic bottles and some paint for a fun snowflake creation! 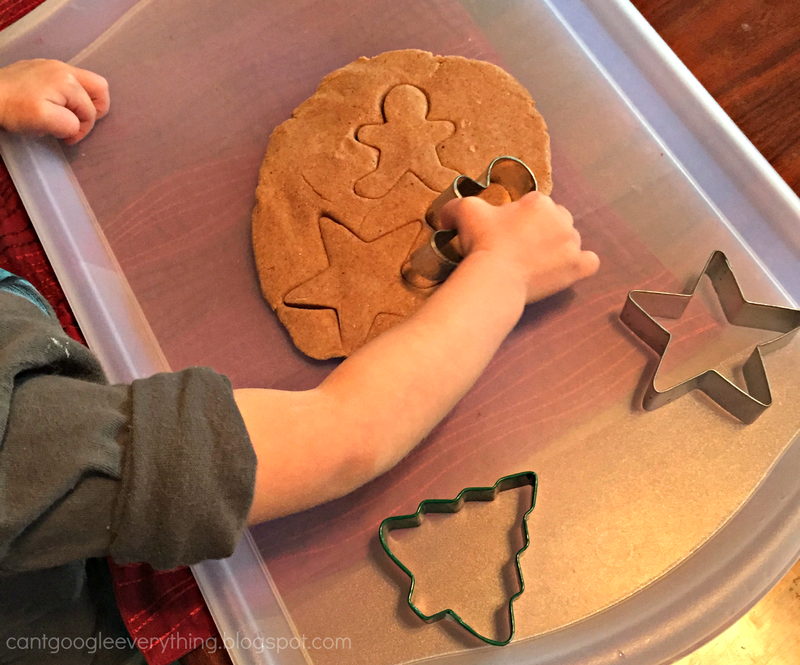 Day 2: Make Festive Playdough: We created ginger bread playdough using this recipe! Day 3: Create snowmen using paper plates! Day 4: Make cinnamon applesauce ornaments to hand out to the neighbors. We’re going to this recipe! Day 5: Host a cookie decorating party! Put out different colors of icing and sprinkles and let the kids go nuts decorating some cookies! Day 6: Make “stained glass” with tissue paper and contact paper! Cut the contact paper into festive shapes to decorate your windows or the holidays. Day 7: Print out some mix and match puzzles! This is a free printable that comes with Christmas characters such as Santa, a reindeer, a snowman and more! Day 8: Set up a felt Christmas tree for your kid to play with! They can move around all the ornaments and hopefully choose to play with this one rather than pulling the ornaments off your real tree! Day 9: Color gingerbread men! Print up a gingerbread man coloring page and “decorate” them using different craft supplies. Bonus: eat some gingerbread cookies, too! Day 10: Have a Christmas themed bathtime! Dye the water green using bath drops and cut out Christmas shapes from foam to stick to the walls! Day 11: Play indoor snowball toss- with cotton balls and decorated cups! Draw snowman faces onto white paper or Styrofoam cups and take turns trying to toss the cotton “snow” balls in! Day 12: Create something with toilet paper rolls! We made a menorah, but you can also do snowmen, reindeer, Santa, an angel or even a Christmas tree! We haven’t done all 12 of these activities yet, but I plan to finish this list before Christmas! Which activities do you plan to try out? Want even more Kids Holiday activities? Check out my Kids Holiday Crafts Pin board! Follow Rachel B // Kids Holiday Crafts on Pinterest. Good list, especially for the days right before Christmas when kids are bouncing off the walls with excitement! These are great ideas! I totally agree that trying to squeeze 24 activities into 24 days is a recipe for disaster. I'm shooting for 1-2 a week plus reading Christmas books at bedtime. I have a friend looking for easy craft activities like these – perfect timing to pass along! So many good ideas! I can't seem to get myself together enough to do any of them!